With the goal of harnessing the untapped potential of Iranian-Americans, and to build the capacity of the Iranian diaspora in effecting positive change in the U.S. and around the world, the West Asia Council has launched a series of interviews that explore the personal and professional backgrounds of prominent Iranian-Americans who have made seminal contributions to their fields of endeavour. We examine lives and journeys that have led to significant achievements in the worlds of science, technology, finance, medicine, law, the arts and numerous other endeavors. 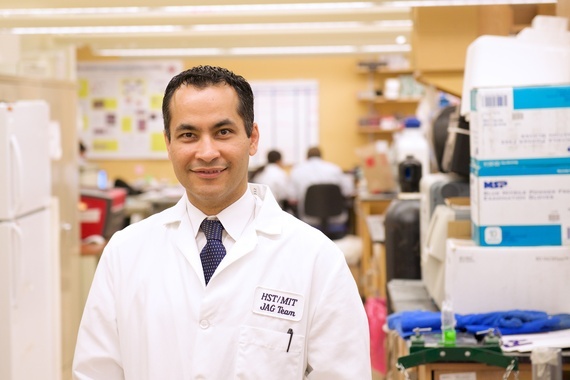 Our latest interviewee is Dr. Ali Khademhosseini. Dr. Ali Khademhosseini is a Professor at the Harvard University and also teaches at the joint Harvard-MIT Division of Health Sciences and Technology (HST). He is also the director of Biomaterials Innovation Research Center at Brigham and Women's Hospital (BWH) where he leads a large interdisciplinary team of over 90 researchers.His research is based on engineering biomaterials to enable regenerative medicine and the next generation of medical devices. He is also developing organ on chip systems that aim to mimic human response to various chemicals for drug discovery applications. His work has been recognized by over 40 major national and international awards. He is the recipient of the Presidential Early Career Award for Scientists and Engineers (PECASE), the highest honor given by the US government for early career investigators. He is a Fellow of the American Institute of Medical and Biological Engineering (AIMBE), the Royal Society of Chemistry (RSC) and the American Association for the Advancement of Science (AAAS). He was born in Tehran, Iran and raised in Toronto, Canada. He studied chemical engineering at the University of Toronto and obtained his PhD in bioengineering at MIT in 2005. For more details, please click (here). Can you tell us about your background? As Iranian student who immigrated to Canada and then applied to MIT as an international student, you have had an international background. Can you tell our readers about what challenges you experienced. As a young person moving to a new country, it's always difficult to initially get accustomed. It was a big challenge to learn the new language, while trying to get acclimated to a new place and make new friends. One of the great things about Toronto is that there is a huge international presence, so I had a lot of diverse friends growing up that were from many different countries. Overall, I would say that moving to Canada from Iran was a very good learning experience and prepared me to be better able to take on challenges. You are recognized as a leader in combining micro- and nano-engineering approaches with advanced biomaterials for regenerative medicine applications. Can you share the highlights of your work? Our research focuses on developing new materials for medicine and enabling new therapeutics. Micro and nano technologies enable us to precisely control cells and the cellular environment. Since cells interact with their environment at the micro and nano scale, it's important to engineer materials that mimic the natural cellular environment and to better understand the exact length scales with which the cells interact. The ability to control cells will enable us to create artificial tissues for transplantation and medical devices that can be implanted within patients. Micro- and nano-engineered platforms will have better outcomes in comparison to current technologies that are in place. Your laboratory has pioneered numerous microfabrication technologies for controlling the architecture and function of engineered vascular tissues. Your Lab uses a multi-disciplinary approach, to develop micro-scale and nano-scale technologies with the ultimate goal of generating tissue-engineered organs and controlling cell behavior. Can you tell us the most significant area of research so far? Two areas of research in our lab that we are particularly excited about are our organs-on-a-chip projects and our smart band-aid projects. Regarding organs on a chip, one of the major challenges in drug discovery and development is predicting how these drugs will behave in humans. When you are discovering these drugs you cannot test them on humans right away, so you have to test them on cells outside the body and then in small animals and then in people. However, the cells of small animals, such as rats and mice, do not behave and react like human cells. What's toxic in humans may not be toxic in rats and mice. The goal of our organs-on-a-chip project is to recreate body systems on small chips that we can use to predict how these drugs work before human trials. Instead of just creating one type of organ or tissue, we try to recreate the whole body physiology; for instance, liver, heart, bone and skin. We then interconnect these tissues and organ chips so they recreate the complexity of the natural human system. This allows for more accurate drug testing because it enables us to see how drugs interact with the whole body instead of just one specific organ. We are very optimistic that this technology will greatly reduce drug manufacturing costs and help reduce the cost of healthcare in general by providing an easy, safe, and less costly mechanism to test potential drugs. Another aspect of our research focuses on creating "smart" band-aids. We have used the latest technology to make miniature and flexible electronics that can be incorporated into band-aids. These band-aids will have the ability to detect whether the wound is healing properly and then deliver drugs to the wound site to induce healing and avoid infection. This technology is a critical game changer- especially in common diseases like diabetes where diabetic ulcers are a consistent issue. We believe that this technology can greatly reduce health care costs, decrease the need for repeated hospital visits, and greatly improve patient outcomes. You have utilized cutting-edge techniques to mimic the microenvironment that heart muscle cells need to make functional, beating fibers. Could you elaborate on that? Historically, researchers have constructed simple scaffolds that provide structural support for cell attachment and tissue development. However, these scaffolds are too simple and are not able interact with the indwelling cells. Our work focuses on creating scaffolds with responsive elements that enable cellular interaction. We achieve this by combining novel advanced biomaterials with 3D printing technology. For instance, we can design 3D print fibers, align muscle cells on these fibers, and create an engineered tissue that will have the same contractile properties as the patient's own tissue. Many researchers around the world are trying to grow living tissue, but your work is unique in its "bottom-up" approach. You focused on assembling the individual pieces. Tell us about your approach. Another way in which we're trying to make tissues is through using tissue architecture that is native to the bodily environment. When we look at the body, our tissues are highly organized with respect to each other in a very particular way. We make miniature building blocks of tissue and then assemble them together to make the larger tissue structures, similar to how individual bricks are used to make buildings. Our lab focuses on making these little miniaturized tissues and then assembling them together to make the larger tissue structures. This is a technology that our lab has really pushed forward. The tangled highway of blood vessels that twists and turns inside our bodies, delivering essential nutrients and disposing of hazardous waste to keep our organs working properly, has been a conundrum for scientists trying to make artificial vessels from scratch. Now a team from Brigham and Women's Hospital (BWH) under your leadership has made headway in fabricating blood vessels using a three-dimensional (3D) bio-printing technique. Can you tell us about this project? Our lab has had a lot of exciting breakthroughs through the use of 3D printing technology. Because medical implants and tissues need to be customizable to the patient, 3D printing is a very powerful technology. We have further developed this technology through using specialized materials and cells that can be 3D printed into different structures. One of our primary innovations is that we have been able to 3D print blood vessels that can be seeded with cells and can further provide the types of nutrients needed for them to grow. Since vascularization is a huge challenge in tissue engineering, we are optimistic that our technology will help solve this challenge. What are the implications of clinical applications in tissue engineering? There is no question that tissue engineering will one day transform medicine. Many therapeutics right now, such as drugs, require constant administration and, in many cases, life time use. If we can engineer specialized tissues that can recreate the function of the organ, and eliminate the need for these types of drugs, it will have huge implications for cost of health care and will drastically improve quality of life for patients. You regularly visit many different countries and give seminars, among which is an exchange program in Japan where you mentor a number of post-docs and advise them on research and development (R&D). Have you done a similar program in Iran? This is a very interesting and timely question, especially in the context of the recent advancements in Iran with respect to the opening of Iranian markets and Iranian universities after many years of sanctions. I think that this is an interesting time to look at Iran and the opportunities that exist there. I recently traveled to Iran and have seen firsthand that there are many opportunities. Iran has an educated and young population, which is a huge advantage in trying to change Iran's economy from oil-based to knowledge-based. The ability to start competitive research institutes in Iran is essential in order to build the knowledge to enable the creation of companies and jobs that will boost the Iranian economy. Personally, I find this very interesting and I would be happy to explore those kinds of opportunities in the future.